I had the opportunity to speak with two of the hottest men from Tears of Crimson late last night, and I jumped at the chance to dig a little deeper into the latest news from the New Orleans Vampire Bar. Rafael Santiago is the club owner, and Gabriel Domitian, the investor and silent partner. 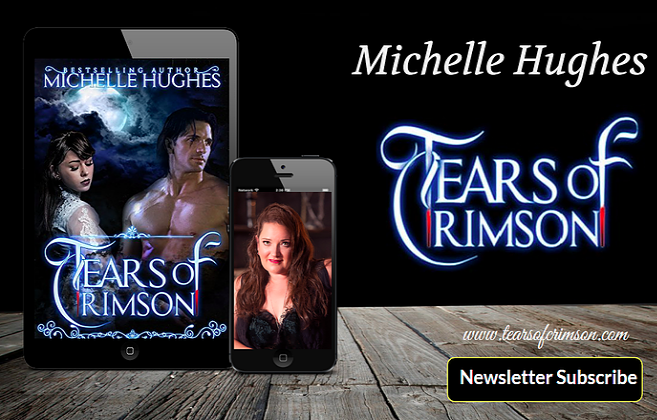 Julie: Thanks so much for taking a minute out of your busy night to share with us the latest happenings at Tears of Crimson. There's a lot of talk going on about some event that will change the way people think about life in the Quarter, could you tell us a little more about that? Gabe: You can pay my usual fee later, but let me just say that people are going to be shocked when we decide to unveil the plans for the coming year. Rafe: Ignore my brother, he hasn't had his, um wine yet this evening. The upcoming event really isn't something we're willing to disclose just yet, but you have my word, when we can discuss it, you'll be the first to know. 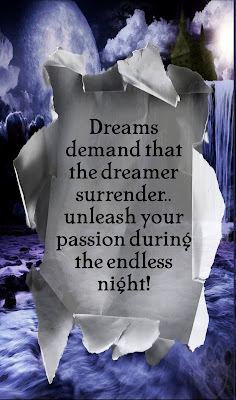 He is calling to you from the dream, patiently he waits to share the passion he held in check. When he arrives he will show no mercy, and demand nothing less than your soul in return. His desires will unfold and demand everything you've refused, how will you be strong enough to fight the temptation of endless night? Tears will fall, hearts will discover the true price of love. In the end, eternity will refuse to be denied. Revel in the time you have to find peace, soon your world will change before your eyes. For now, you have a choice, where will you be when the crimson tears begins to fall? We're asking for your help and giving you a little taste of Crimson as a reward. 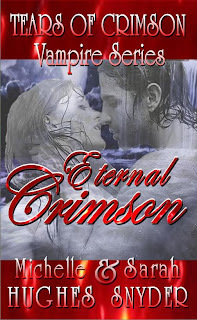 Visit https://www.createspace.com/pub/community/give.review.do?id=1096767&rewrite=true and read the prologue and first chapter of Eternal Crimson. Then answer the two questions included with that link. This would mean a great deal to us, so please take a few minutes of your time and offer your opinion. Thanks again for everything you do! Star Whackers - Fact or Fiction? Many of you might remember Randy Quaid from movies like: Independence Day, Brokeback Mountain, Caddyshack II, or dozens of other great films. So what has him fleeing for his life? Quaid, and his wife Evi, believe they are in danger from an Estate planner that wants to cash in on all the money he's managed to bring in over the years. According to their own words, they can't even get a credit card or stay in a hotel without trouble these days. Quaid claims that there are a group of people that have the ability to manipulate the banking system and criminal system and blames them for falsely accusing him of criminal acts to smear his name. On another interview he states that these "Star Whackers", they are sabotaging not only their credit, but credibility as well. Three of the people that be believes are responsible are Hollywood lawyers and a business manager. What would these people have to gain by discrediting the actor? According to Quaid, they have access to the royalties from his films by creating a phony probate file, secret trust, and fake bank accounts. He even claims they have been able to access his life insurance policy and use bogus loans taken out in his name. These are pretty big claims and one has to wonder why there's not more coverage on this topic. So is Quaid being stalked or is this just another Hollywood actor trying to gain renewed notoriety for himself? I'll leave that decision to you, but will say that sometimes truth is stranger than fiction. I'd love to hear your comments about this, so drop me a line and tell me where you stand. A Night at Tears of Crimson gets a face-lift! I know you've heard me mention this, but it is now in the works. The original Tears of Crimson book is finally getting it's face-lift. Thanks to an incredible editor and some great ideas, A Night at Tears of Crimson is undergoing a transformation. I want to thank everyone that purchased the first book in this series, and hope you'll enjoy the revision as well. I'll be posting all the information here as soon as it's complete. After months of deliberation, I've decided to keep this book in first-person format and just polish it. The beautiful face of Cara won't change but it will be in a new format. This was my first experience with writing, and while I love the story-line behind the book, there were many alterations that needed to occur to make it more professional. With the third, and last installment of the Tears of Crimson series being written, the time seemed right. This series has been a huge part of my soul for more years than I care to admit, and it's with great pride that I'm glad to watch it come to the conclusion. I hope my readers will stay with me as I venture off into new adventures. Tears of Crimson books has come a long way in the last two years. It still amazes me at how much support this book and the site have received. Thank you so much for all your love and support. I'm really excited to see what the following years brings. I'll begin by honestly saying I do not like vampire books and just downloaded this as it was on free promotion. I had previously tried Twilight and just couldn't get into it and thought this would be more of the same. Boy was I wrong! This is more than a romance, though the many steamy scenes added plenty of romance and passion, and again not scenes that are normally my cup of tea! However as a fan of science fiction and fantasy and more inspirational themes I was very taken with the back world and back history of the vampire race that Hughes has created. It fleshed out the whole vampire mythology for me and for the first time I actually wanted to know more about the vampires, where they came from, their belief system and their origins. I really enjoyed this book and the three love relationships it contained also fleshed out the value system from different angles. I'm still not a vampire fan but I would read another by Hughes, especially if she ever decides to really go for it and write a prequel that takes us even further into the world the vampires come from and still visit. If I liked it this much then I can only imagine that real vampire fans will absolutely love it. 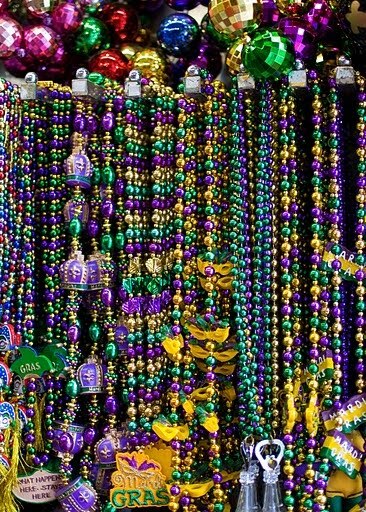 As most of you know, because I've whined about it all month, my schedule could not include a trip to New Orleans this year for Mardi Gras. Last night, as in most nights, Rafe came through for me in my dreams in a big way. Most of my dreams I save for my books because they involve Rafe and Cara together, but last night Rafe decided to visit my real self and give me a treat. He asked me to close my eyes and breathe deeply, and of course I couldn't refuse him, when have I ever been able to deny him? As my eyes closed we began soaring over the French Quarter and all the festivities going on below. The dream was so life-like, and in full cover, it felt as if I were actually living the moment. I could feel the breeze on my cheeks and the excitement moving through my veins. What better view of Mardi Gras can one have, flying through the clouds with a beautiful dream lover as my guide? Once again Rafe made a dream come true, the same way he has influenced every positive thing in my life over the years. And the best part? I didn't have the hangover that my friends will be suffering through after their nights of partying in the streets last night. In my book, this is a definite win! 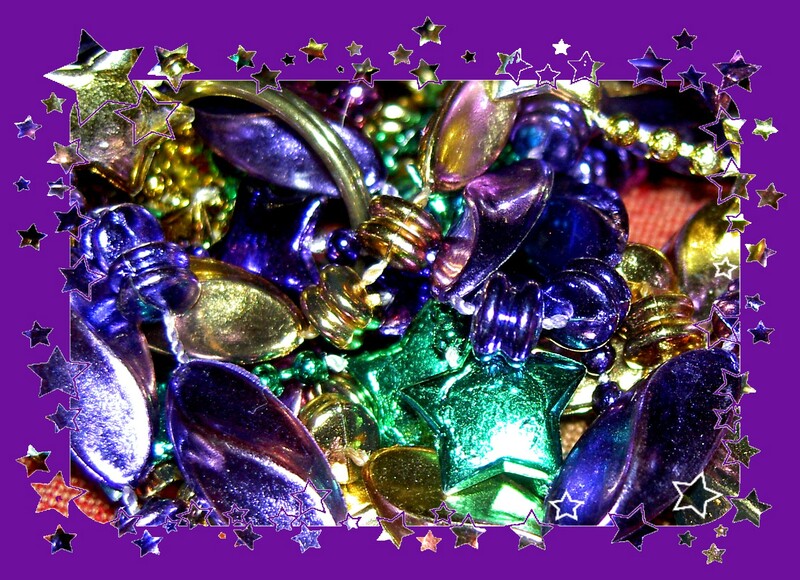 Thank you Rafe for giving me the opportunity to enjoy Mardi Gras 2012 in your own special way. Happy Valentine's Day! Free Book! Happy Valentines Day from Tears of Crimson! Enjoy A Night at Tears of Crimson for your kindle today only free! Thank you so much for all the love you've shown us, I hope you'll accept this gift in return! 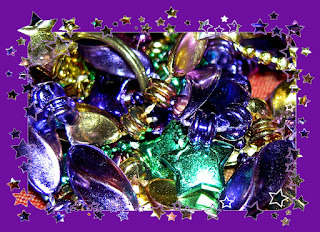 So it's Mardi Gras week and I'm not in New Orleans, which is a completely different story but I thought I would mention it anyway, and I'm in the mood to be silly. Alright you caught me, I really don't know any nuns. Even if I did know a nun, I'm sure they wouldn't be hanging out in bordello's. Since it's Mardi Gras and I'm obviously stuck in Alabama though, I decided to give this blog post a nifty title. According to most of the people where I live I'm going to hell anyway for writing about Vampire's, I might as well keep the momentum going? I really would hate for people to get the idea that I probably know more about religion than most of the people trying to send me off into damnation. Eternal Crimson Free for Two days! Eternal Crimson, the newest title in the Tears of Crimson Vampire Series, will be free on Amazon for two days only as part of the promotion. 02/12/2012 and 02/13/2012. I'd like to encourage all our friends to visit this Amazon Link on those days to get your copy for Kindle. This book is filled with tears of crimson, and I'm so happy to finally see it online. The physical copy of the book will be announced soon. What didn't make it into the book? I'm glad you asked, because I thought I'd share it with you here today. This actually gives some great insight into the creation of Singe Tsigan, but it wasn't the way to start off a romance book. I hope you enjoy this hidden gem. It was hard to make this decision, but in the end it made sense. A quick note: This has not been professionally edited because it didn't make the cut. Tears of blood have rained over New Orleans in anticipation for the second book of the Tears of Crimson Vampire Series. The book is now available on Amazon with the print version set to release on Valentine's Day 2012. 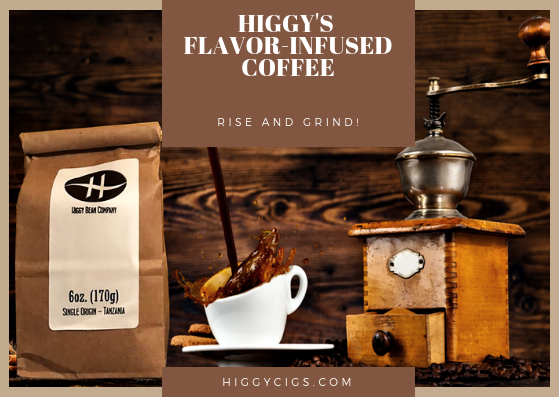 With Eternal Crimson, we discover the world of Singe Tsigan and many new supernatural beings that are just waiting to compel your dreams. This is not your average vampire book and it's waiting for the not-so-average vampire reader. When you step through these doors, be prepared to have everything you believe challenged! Talk about tears of blood! I wonder if Rafe has any idea how hard it's been to get his and Cara's story out. Outside of the dreams I'm plagued with every night, which most of the time I don't mind, this formatting thing has been for the bats. If anyone tells you that self-publishing is easy, seriously thwap them on the head for me! Eternal Crimson has just been published to Amazon but it will probably take time before you are able to purchase it. This book has definitely been a labor of love and agony. I'd love to say the hard part is over, but it's just beginning.